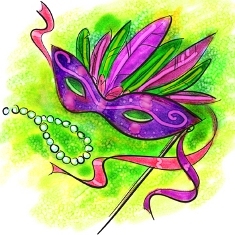 Coming up with creative Mardi Gras menu ideas need not be complicated. All you need is traditional New Orleans dishes, a bar full of potent beverages and a merrymaking spirit. Serve up a fun meal inspired by the celebration and feast like they do in the Big Easy. 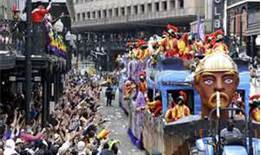 I was born and raised in New Orleans and have enjoyed countless Mardi Gras celebrations. I once thought that Mardi Gras only had meaning to New Orleanians. Now I realize that the whole world LOVES this party! 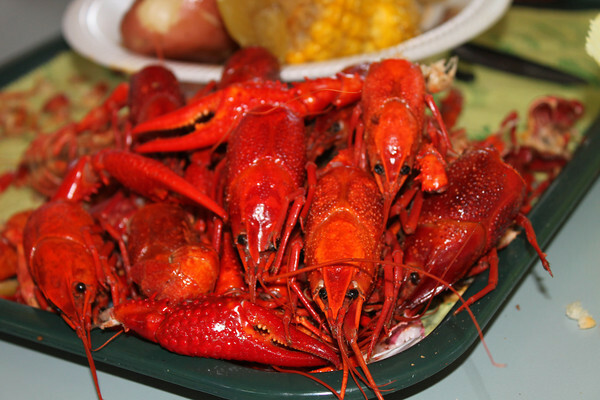 Typically, New Orleanians do not host "house" parties during the day. Come on...the party is in the streets! Growing up, Mardi Gras day would often start with buttery shrimp and grits, along with scrambled eggs, bacon and biscuits. My fondest memory is of my mom's special fruit filled bread pudding (recipe below) that we would have for breakfast. What a treat! My mom would also prepare salty oven-roasted peanuts in the shell. 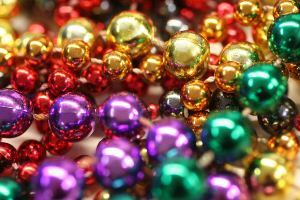 We would take them along as we headed to the parades on Claiborne Ave., to collect doubloons and the famous Zulu coconuts. We would then walk down to a now closed "hole in the wall" and have the best hot sausage po'boys ever! Hot sausage is a spicy, paprika-laden pork sausage similar to raw chorizo, not surprisingly once called chaurice in Louisiana. Super delish with red beans and rice! As I got older, I still partied in the French Quarter, indulging on Hurricanes and Lucky Dogs (local hot dog carts). At midnight, all over the city, police cars would blast their sirens to signify the end of the fun. After the street celebration ended we would often gather at a friend's home to feast on gumbo, catfish po-boys, shrimp Creole, and of course, more potent cocktails. I have not lived in the Big Easy for many years now and I must often "educate" my Northeastern friends on the proper way to party. Here are some of the Mardi Gras menus I have created to celebrate this crazy, debauched time of year. Beat eggs thoroughly. Whisk in sugar, milk and vanilla. Pour the egg mixture into a shallow glass dish. Heat a large skillet or griddle to medium-low and add butter until it melts. Dip each slice of bread into the egg mixture, coating well on both sides. Drain off excess liquid into the dish. Do not oversoak the bread slices. Cook bread until golden brown on first side, turn and brown the other side. Serve lost bread right away with butter, syrup and/or powered sugar. This bright salad features the traditional Mardi Gras colors of purple, green and gold. For the salad greens use a mixture of green leaf, spinach and arugula. In a small bowl, whisk together the vinegar, honey, mustard, pepper, salt, garlic and oil until thoroughly combined. Chill until serving. In a food processor, pulse the tomatoes until roughly chopped and still chunky, do not over process. Alternatively, use a potato masher or to sharp knives to break up the tomatoes. Sauté green pepper, onion, and celery in hot oil in a large nonstick skillet, about 10 minutes or until tender and lightly browned. Add garlic, and sauté about 1 minute or until fragrant. Stir in chopped tomatoes, hot sauce and seasoning blend. Bring to a boil; reduce heat, and simmer, uncovered, 30 minutes. Taste for seasoning and add salt, pepper more seasoning blend, if needed. Stir in shrimp, cover, and simmer 3-5 minutes or just until shrimp turn pink. Add parsley and serve over hot white rice. Use a mixture of soft fruits such as strawberries, blueberries, blackberries, peaches, pears and bananas. My mom added maraschino cherries, but that's optional. Heat oven to 350°. Butter an 11" x 7" or 8" x 8" baking dish. In a large bowl, whisk together the milk, eggs, sugar, vanilla, spices and lemon zest. Add the bread and let sit about 30 minutes to allow bread to absorb liquid. Stir fruit and nuts (if using) into the bread mixture. Pour into the prepared baking dish. Set the baking dish in a larger pan and set in oven. Add enough hot water to the larger pan to come half-way up the sides of the baking dish. In a double boiler, cook butter and sugar until completely dissolved. Add egg, beating very quickly so that it won't curdle. When the mixture smoothes add whiskey. This recipe comes close to the fried chicken at the famous New Orleans restaurant, Jacques-Imo's. Adding chopped pickles to the hot chicken lends a salty, sour tang to the velvety chicken meat. Using evaporated milk adds richness without the fat of cream. In a large, heavy skillet, heat the oil to 350º. In a bowl, whisk together the evaporated milk, water and egg and season generously with salt and pepper. Season the chicken with salt and pepper and dip each piece in the milk mixture and then in the flour. Add the chicken to the skillet and cook over moderate heat, turning often, until golden and cooked through, about 25 minutes. Lower the heat so that the chicken doesn't brown too quickly. Transfer the chicken to a rack to drain, then arrange the pieces on a platter, sprinkle with the pickles and parsley and serve. Heat oil in a large heavy-bottomed pan over medium-high heat. Working in batches, quickly brown beef, removing to a plate when done. Add additional oil to the pan to equal 4 tablespoons. Add flour and make a medium dark roux LINK. Add onions and peppers, sauté until onions are translucent. Stir in garlic, thyme, bay leaf, chicken stock and tomatoes and sugar. Add browned round steak and any accumulated juices. Bring up to a boil and reduce to a simmer. Thoroughly mix in tomato paste and cook covered, until beef is tender, about 45 minutes. Check for salt and pepper and add to taste if needed. Remove bay leaves and stir in fresh parsley Serve over hot grits and pass the hot sauce. This is the last day for good Christians to eat too much, drink too much and party way too hard before beginning the somber Lenten season. Of course, Christians aren't the only ones invited to the party and the entire state has the day off!